If you've got anything irreplaceable that evokes fond childhood memories, you should throw it on a fire right now, otherwise you'll end up spending your time like I did this weekend. "How many Bolingbrokes does it take to change a lightbulb? All of them, one to change it, the rest to try to fix the old one." This weekend it was time for the traditional annual mending of the fairy lights. The fairy lights came from Woolworths, they cost 7 and 6 and were given to us by a dear family friend in 1967 or 1968. Each of the 20 lights had a vivid coloured plastic shade and a screw-in bulb. They don't have a 3 pin plug, instead they go into a bayonet light fitting (For my American readers, this is the UK equivalent of an Edison Screw). By the 80s the lights were too dangerous and unreliable to carry on with. 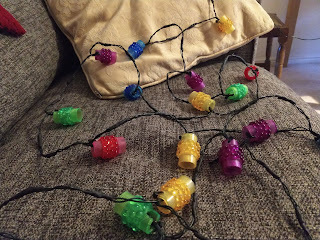 Each of the iconic plastic shades and the obscure mains connection was grafted on to a new string of fairy lights. The new set had state of the art capless bulbs which were (then) easy to replace. This year too many of the (now) irreplaceable bulbs have failed, but neither my mum nor I can bear to throw the lights away. 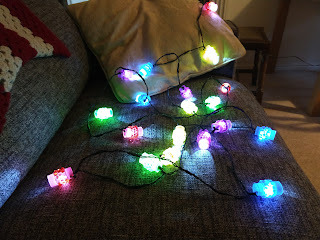 The problem with grafting the shades onto a new string of lights is that modern ones have much larger numbers of individual LEDs much more closely spaced. I found a set of 100 bright white LEDs with a construction that I could modify. I first shortened it to 58 lights and then removed every 2nd and 3rd light. I spliced and re-insulated these 80 connections, and fixed the 20 original shades to the remaining lights with tiny cable ties. I was at the pillar drill for at least half an hour and I listened to 3 albums just while I was insulating solder joints. But I have made a working replica (mockery?) of my favourite Christmas lights.